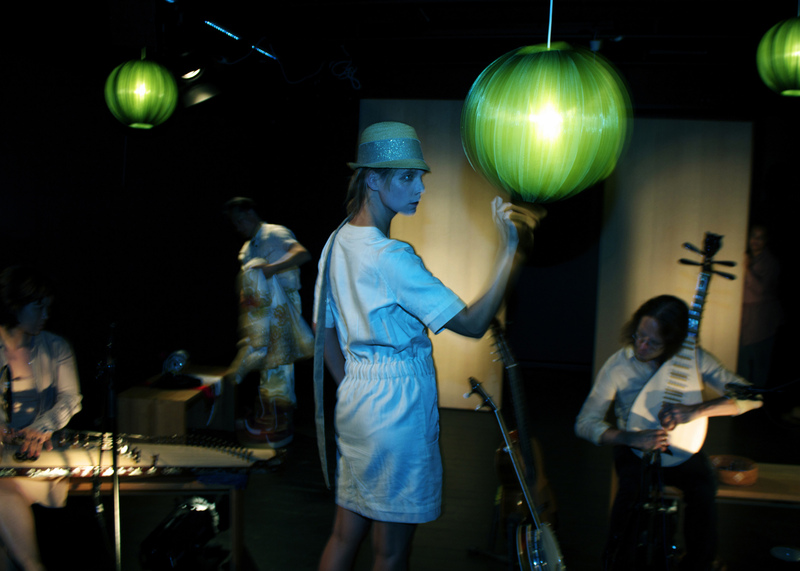 IDIOMS is a piece of experimental music theatre with three actors; Pia Örjansdotter (Sweden), Nguyen Duc Manh, (Vietnam) and Valerie Curtis-Newton USA, and the three musicians in The Six Tones (Vietnam and Sweden). The text in the piece (written by Jörgen Dahlqvist) is in English, Swedish and Vietnamese and can be understood as a deconstruction of three classic stories of impossible love across cultures and social barriers: Marguerite Duras: L’Amant, Shakespeare’s Romeo and Juliet and the Vietnamese tale of My Chau and Trong Thuy. The different traditions that the actors represent provides a range of expression in a wide span between spoken theatre and opera. The music, which in a similar way weaves traditional Vietnamese music together with experimental Western music, is produced by Richard Karpen in dialogue with the three musicians and the computer programmer Josh Parmenter from DXARTS, University of Washington. The piece was developed and studied within the frame of the international research project (Re)thinking Improvisation headed by the Malmö Academy of Music. IDIOMS constitutes the main artistic outcome of one of the strands of the project. The sessions in June and August were documented on video and was subject to qualitative analysis by several of the participating artists and researchers. A book chapter by Stefan Östersjö and Kathleen Coessens discussing IDIOMS from the perspective of the resistance of culture is forthcoming is forthcoming on Leuven University Press. The symbolically charged metaphors, the sense of a relentless destiny, the fragmentary scenes and the flash backs give a sense of a classical, almost archetypical story that has been grinded into experimental fragments in which the voices of the actors are amalgamated with traditional Vietnamese music and experimental electronic sound worlds. My limited knowledge of the Vietnamese language makes me sink into – become enchanted by – the sonorous qualitites of Manh’s mellow voice, rather than trying to understand the meaning of what he is saying. My experience of his singing is highly coloured by his costume and if he is wearing jeans and shirt or ancient traditional clothing. It becomes apparent how essential the context is for our perception and understanding. The group that has the greatest influence is Teatr Weimar. I see their new production IDIOMS, a piece that crosses every border between the arts and cultures. Traditional Vietnamese music along with contemporary art music. Three actors that speak different language […] Idioms is a higly specific piece with a deeply grounded aesthetic. Intercultural dialogue between traditional and experimental arts. In the meeting between performance traditions of traditional Vietnamese Music and contemporary Western art music, the door is also opened to traditional Vietnamese Tuong drama. With the Western actors, also experimental modes of theatrical expression are added to the artistic framework. The project brings traditional cultures in dialogue with state of the art audio technology. The production of the electronics for the performances is done in collaboration with DXARTS at University of Washington. The fundamental building block of the artistic methodology is that of mutual learning. The piece was developed jointly by all the participators, the composer and writer functioning as ’artistic directors’ of a process in which all performers can contribute material to the piece. This open process was intended to result in a piece that is built on the merging of different traditions of improvisation but eventually leading to a theatrical work which has a fixed identity and structure. The second series of sessions took place in October 2010 in Hanoi. The main objective with these sessions was to find an actor from the traditional Vietnamese theatre who might want to join the project and to continue developing the material in sessions also with the three musicians. 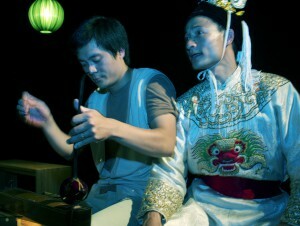 This is the point at which the collaboration with the Ha Noi Tuong Theatre was launched. When we had decided to work with Nguyen Duc Manh we worked at the Tuong Theatre in the first workshop with him. It became clear already in the auditions that the elements of Tuong projected by Manh would become a central element in the new piece. The main part of the artistic work took place in two series of sessions in June and August 2011, now involving all six performers as well as the two ’artistic directors’ and a computer programmer. These sessions led to the the world premiere of the production in Malmö in September. The first touring period was in Scandinavia in November 2011 including a performance in Malmö during the Connect festival (at Moriskan) followed by Stockholm, Växjö, Gävle and Härnösand. We are making plans for touring the piece in the USA and in Vietnam in the coming years.